How do sanitary kits boost up the quality of girls education in Somalia? | Sahra Ahmed Koshin - Exploring, Researching and Documenting Gender Issues in Somalia. By Sahro Ahmed Koshin, Gender Technical Adviser and PhD Candidate. Contributing to efforts geared towards bridging the gender gap in the education sector in Somalia through lobby-oriented activism and professional writing. The CARE-led EU-funded Waxbarashada Waa Iftiin (WWI- Education Is Light) Education project works closely with the Gender Unit of the Ministry of Education in Puntland. The WWI project strives, among others, to contribute to the overall achievement of one of the goals of education in the world; gender equity towards empowerment, this is in line with Education for All (EFA) and Millennium Development Goals (MDGs) and WWI aims to address issues affecting girls education in Somalia so as to enhance girls’ participation in education by ensuring that more girls enroll in school and the enrolled girls stay in school long enough to complete a full cycle of education. The provision of sanitary kits to school girls and training them on life skills and health issues is one way through which the project envisages to achieve this. The WWI is the first project of its kind in Puntland to ever massively disseminate reusable hygienic sanitary kits to school girls on a well-organized large scale manner reaching out to all the regions in Puntland. Over 2000 school girls have been trained on life skills hygiene, health and hygiene matters care/hygiene and sanitary towels. 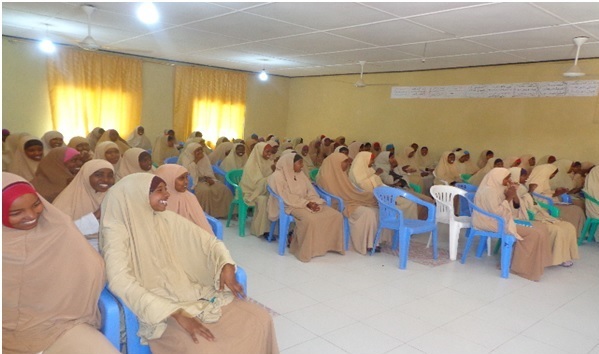 Between November of 2013 and January of 2014 the Gender Unit of MoE Puntland in close collaboration with the CARE-led WWI team visited over 20 secondary schools throughout Puntland where they conducted a 2-day training workshop in each of the 20 schools on life skills, health promotion and hygiene/sanitation to over 2000 secondary school girls. Following the trainings was the dissemination of over 2000 reusable sanitary kits to the same girls in the same schools. This article discusses how the life skills training workshops combined with the dissemination of sanitary kits have been received by the students, the school and the communities we visited. 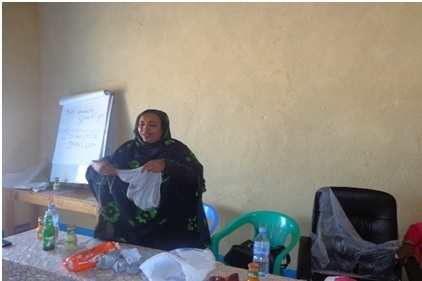 The article brings to light the correlation between the provision of reusable sanitary kits to female students in secondary schools and its impact on the education and even participation as well as performance of girls in both and class and schools in Puntland. It will argue that the regular provision of clean, hygienic and sustainable reusable sanitary kits to school girls in secondary school will indeed benefit them in so many ways than one. This article will dismantle, decipher and demystify how exactly reusable sanitary kits benefit young girls in schools. It will portray the voices of the users and show concrete examples of how the provision of regular clean, hygienic and sustainable sanitary kits to girls has boosted up their self-confidence, their attendance in school and even their active participation in schools and in communities at large. How does menstruation impact the education of Somali girls in Somalia? we have seen a trend which shows that the number of girls continuing their education past primary school decreases by every level of education. Adolescent girls have very little information about menstruation before they experience their first menstruation and this ignorance leads to various reactions including worry, shyness, embarrassment and nervousness. Another significant finding is the lack of adequate education about hygiene management of menstruation and the provision of facilities for disposal of menstrual materials.Very few girls enroll in secondary schools, early marriage, maturation and menstruation issues affect girls between the ages of 11-14 years, sometimes forcing them to leave school. Girls that do enroll and attend school, leave classes at the beginning of their menstrual cycles because they cannot afford to buy sanitary towels. On average a Somali girl is absent 5 days a month and multiplying this by the number of months that significantly amounts to almost to about 45 days a year. As Anisa and at least 15 other school girls explained they normally don’t go to school when they are on their menstruation. This is is most certainly the case in schools where is no running water and bad sanitation. They are forced to keep away from school to avoid the embarrassment caused by lack of proper hygiene kits for use during this time, as well as the limited awareness that this is a normal development phase in their lives. Many girls are afraid of leaking at school and staining their uniforms. Absenteeism becomes the order of the day whenever menstrual periods show up and this is exacerbated by the social stigma from male counterparts in school. Due to absenteeism, girls lose on average several hours of important lessons in the annual school program resulting to poor performance and repeating of classes, lowering of self-esteem plus morale for education and often times eventually drop out of school completely. The girls fear teasing by boys at school if they accidentally stained their uniforms. The girls often don’t have a place to go to for help or to find another uniform/clothing or tampons or even a place where the girls can wash their clothes and hang them up to dry. The girls also explained that there are no or very few female teachers in schools to whom they could go to for advice and to and seek assistance. The attitudes and behaviour of fellow students bullying girls in classrooms or in schools who have stained their uniforms with menstrual blood is one of the most dreaded worries that girls have. It is their biggest nightmare. Even after many long days, weeks or months after such an embarrassment the girl in question will feel uncomfortable in that particular school. Others are afraid to stain themselves and therefore opt to stay indoors at home that whole week. Why provide sanitary kits to girls in school? What are the benefits of the reusable sanitary kits? The WWI project seeks to enhance girls’ participation in education through the provision of sanitary kits to vulnerable girls in 20 secondary schools. It is envisaged that provision of girls with locally appropriate, reusable sanitary kits, including sanitary napkins, three pants and soap will enable girls’ to go to school even during their menstrual cycle. This will further be complemented by the girl-friendly spaces to be constructed in these schools. The school girls have been trained on life skills and health promotion so as to enable them deal with issues related to low self esteem, lack of confidence, unassertiveness, inability to make decisions, negotiation and speak out, self control, leadership skills as well as self cleanliness as a way to avert menstruation related infections. The benefits of the use sanitary kits by secondary school students is incalculable. First of all, the provision and dissemination of the sanitary kits have boosted up the girls’ self-confidence because the girls are not afraid/embarrassed during the menses and this has has the potential to translate to improved performance in their studies. Secondly, the way these particular sanitary kits have been designed also contribute to the high self confidence; the underwear is equipped with a pocket underneath the pant where the pad/towel is to be securely placed so that it wont easily fall out when in movement. The sanitary kits are designed with the active school girl in mind. This means that girls can confidently take part in school sports and or walk about with a feeling of self-esteem and reassurance. Thirdly, because the kit has some 6 towels/pads and some 2-4 pants, female students have enough pants and towels with them to carry to school each month. They can easily be carried in the schoolbag and girls can change the towels whenever they need to. Moreover, the kit comes with a bar soap, some washing powder, sometimes even a petticoat and painkillers, and a user guide all of which contribute to the quality of the sanitary kits. The underwear is a one-size fits all type. Another factor that contributes to the positive feedback and overall success of the sanitary kits use by school girls and the community has to do with the fact that the reusable sanitary kits are locally made by Somalis and by highly respected people and organisation. GECPD is a highly respectable organisation and its founder Nansen Award Winner and Nobel Prize nominee Mrs Hawa Aden Amey is respected by Somalis all over Somalia and not only in Puntland. These factors wash away any suspicion by the local community about the background of the sanitary kits. Additionally because girls now have these sanitary kits with them, the absenteeism rates would eventually decrease as there is no longer a reason for the girls to miss classes during menstruation. Less absenteeism means more attendance and more attendance means more participation and even performance of girls in class and in school. Notwithstanding, there are many women and girls are involved in the making of these sanitary kits. The sanitary kits are manufactured by The Galkayo Education Centre for Peace Development (GECPD) in Galkayo and the girls involved in the production of the sanitary kits are the graduates of tailoring skills training course offered at the same institute. The engagement of these girls in the production of the kits has enabled them to earn some income from their skills to support their families. They are paid on the basis of the number of pieces each woman produces whereby some are able to make as much as $100 per month. Finally the girls as well as school management of the schools were very thankful and showed the MoE/CARE team mush appreciation and thanks. In Sanaag, Al-Nur secondary school management and students slaughtered a goat to thank us for visiting their school. We were served breakfast and treated like royalty. In all of the schools the REO of each region welcomed the delegation and accompanied them to some of the schools and even attended some if not all of the trainings. How exactly do the sanitary kits look like and how much do they cost? GECPD produces the reusable sanitary kits at USD 6.50 per kit and at USD 5.50 for bulk orders. The usual process of delivery is once you order the kit it takes about a week to make the kits. The sanitary kits this used in this activity were manufactured by GECPD and the materials are locally sourced, which is another advantage. Another advantage worthy of been mentioned is that the kits were designed with the active female student in mind. The pocket underneath the underwear secures the towel and makes sure that it doesn’t fall out. Furthermore the materials are easily washed and doesn’t allow staining. In addition Below are pictures of the kits. What is the general community’s attitude about the sanitary kits? After and during the training workshops as well during the dissemination of the kits, the Gender Unit inquired from the girls and collected information so as to understand the impact of the project. Although the exercise is still ongoing, it can be stated that communities in which the schools are located welcomed the initiative. They understand the benefits of the sanitary kits and welcomed the delegation with open arms. The exercise sought to answer three important questions; whether the beneficiaries were satisfied with the kits, whether it was helpful to them in terms of their personal hygiene, health and dignity and whether they felt there was a need for the continuation of the project. Most of the girls contributed to the discussion and felt that the kits were was very useful. They said that the sanitary pads had changed their lives and helped them maintain and restore their dignity. The girls also said that the kits will last longer because they can be used over and over again. 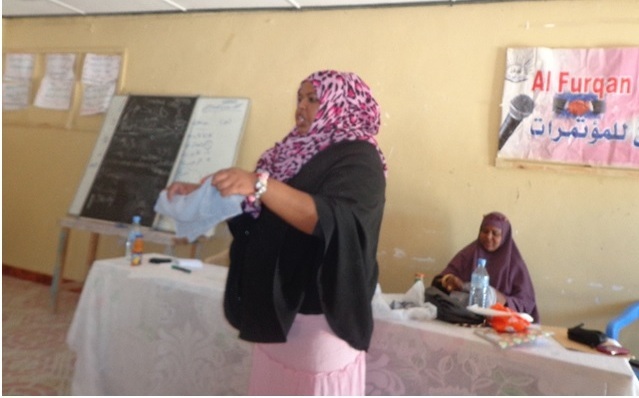 How do Girl-friendly Spaces (GFS) in Somalia contribute to the success of the sanitary kits? The Ministry of Education in Puntland with support from the WWI project has disseminated hygienic sanitary tool kits to over 2000 school girls throughout Puntland. 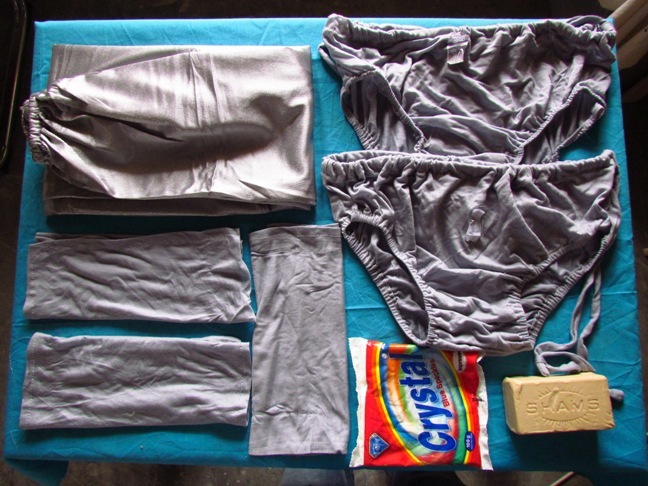 These kits consisted of materials such as towels/pads, underwear, soap and detergent, a user guide with pictures and illustrations as well as a bag which the girls can securely use to keep the sanitary material for use while at school. The WWI project has contributed significantly to the sensitization of school girls on not only the importance of education but also the dissemination of knowledge on how to handle sexual reproductive health challenges through tailor-made and culture sensitive life skills training workshops. It has has supported secondary school girls with the provision of sanitary kits and this has boosted up the girls self-confidence and attendance in school. Although, the retention and successful completion rates at a national level need to be assessed and studied more thoroughly, a longer term project implementation approach is crucial and might provide the opportunity to consolidate any gains towards better assessment of the project’s impact on girl child education and girls’ dignity. The sanitary kits project needs to be expanded to other school in Puntland because many other girls that the project did not reach also are in dire of proper sanitary wear to boost their self esteem and dignity. The Gender Unit advocates that every secondary school should have a GFS and must contain sanitary kits for the students to use. The income generating aspect of the sanitary kits at GECPD where they are manufactured is also an empowerment aspect to women whereby the ones involved in production are economically empowered. This in turn gives women authority and decision making in their households as well as recognition by the community. Lastly, there is need for the government of Puntland to intervene and continue supporting the cause started by NGOs in implementing these programs especially in rural schools. Most NGO programs are limited by financial resources and NGOs provide temporary solutions to long-term problems; once the project end, the problem re-emerges. Finally, as a Somali woman myself i think the provision of reusable, sustainable, affordable, available and hygienic sanitary kits to vulnerable secondary school students, who are in need of sanitary kits every month, is the highest form of empowerment one can aspire to give another individual. Information is power and having a choice even more so. Reblogged this on LEPA Initiative. 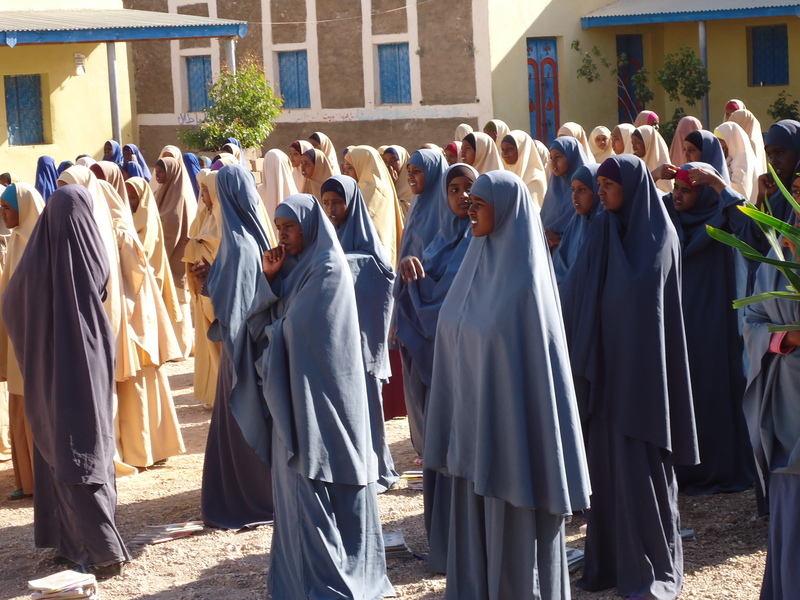 Pingback: Barriers to girls education, enrollment, retention and completion in Somalia | Sahra Ahmed Koshin - Exploring, Researching and Documenting Gender Issues in Somalia.